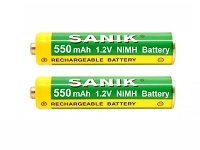 AA 1.2V 1000 mAh rechargable batteries for Solar Garden Lights. They are a direct replacement for the old NiCd 1000 mAh battery. These 1000mAh are used for all types of Solar Lights, the 1000mAh capacity being the correct power for most Solar Garden Lights sold. They are fully rechargeable in your Garden Lights but when new, can benefit from a charge in a household battery charger to get them started. This is because Solar Garden Lights are designed to work in all types of sun conditions around the world and in the UK, we don't have as much sunshine as some other countries!